It's penguins meets... Star Wars? Oh yes, really. Now, let me explain this one. 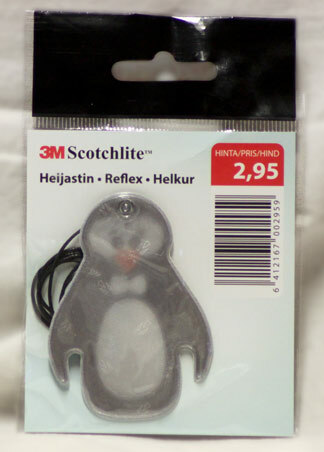 This is a penguin-shaped reflector produced by 3M. In case you happen to live somewhere near the equator, you might not know what these are for. These reflectors are essentially safety devices, much like reflective jackets, only less style-destroying. When the autumn falls here in the north – or far south – the days are so short that indeed, it's better be safe than sorry and wear one of these as a pedestrian. At this point you are likely asking 'what does this have to do with Star Wars?'. Well, this is manufactured by 3M company and it is made of their proprietary material called Scotchlite; retroreflective stuff that, well, reflects even the tiniest amount of light off itself. And this 3M Scotchlite? It's what the original Star Wars lightsabers were made off back in 1977. Yup, before the age of CGI saber blades, the lightsabers were made of 3M Scotchlite. So technically this here penguin is forged from a Jedi lightsaber blade. Thanks to this being made out of retroreflective material, getting it featured was tough. Usually I scan flat penguins, but obviously I couldn't do this here – and even photographing it took a couple of takes to get right.